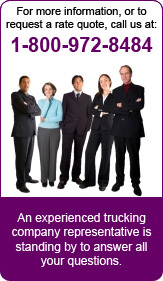 Don’t Trust Your Truckload and LTL Refrigerated Trucking Shipments to Just Anyone. At Great Western Transportation, we understand there’s no margin for error when using Refrigerated Trucking in shipping your commodities – whether they are frozen, chilled or simply temperature controlled. We supply state-of-the-art Refrigerated Trucking trailers with experts in the field to provide you with the most reliable Refrigerated Trucking services available today. So whether you’re shipping a Less-than-Truckload (LTL) or a Full Truckload (FTL), go with people who know Refrigerated Trucking – Great Western Transportation. The 53-foot trailers that we use provide maximum cube and bulkhead capability, so we can handle those mixed temperature shipments. Moreover, the air-ride suspension system cushions the ride so that your product arrives in the same condition it was when loaded. We can transport your goods at temperatures ranging from -20 to +90 degrees Fahrenheit, and hold them at the temperature you specify, and we do this anywhere in the Continental United States and Canada. Dry and Flatbed Truckload and LTL service also available. 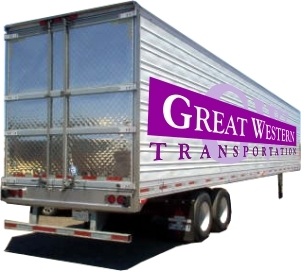 Let us prove to you that Great Western Transportation is your Premier Trucking Service. Call us for information about our trucking services or for a rate quote. A refrigerated van (also known as a “reefer”) is an insulated food grade trailer with a sophisticated refrigeration system built onto the trailer. The refrigerated trailer is designed to transport perishable foods or other commodities that require temperature controlled transport. Some systems have alarm codes that notify the truck driver of a problem that is going to happen or is happening. Once notified, the driver is able to correct the issue, plus taking actions such as employing a high speed temperature pull down that can quickly lower the trailer’s temperature. There are also tracking systems that log the time and temperature for the whole duration of the trip, therefore an audit of the temperature is possible. Refrigerated commodity trucking is divided into two groups: chilled and frozen. Cargo that needs to be transported chilled is generally: fruits, vegetables, and dairy products. These products have to maintain the required temperature to preserve the product until it delivers to the market. These products require sophisticated, expensive monitoring devices to maintain the required temperature, since minute temperature adjustments are necessary to maintain the correct temperature. If the temperature is too low, the product will freeze and spoil. If the temperature is too high, the product will ripen and spoil. Therefore, the controlled temperature technology prolongs shelf life of products or significantly extends them. Cargo that needs to be transported frozen mainly consists of meat and seafood, frozen shipments are much more easily transported. Temperature differences may be slightly greater as the cargo needs to be maintained in a frozen state. When you ship through Great Western Transportation your produce, frozen foods and perishable items will be handled in state of the art refrigerated trailers, by experienced professional refrigerated trucking drivers. We use top notch refrigerated shipping industry technology to provide consistently reliable, on schedule pickup, en route and delivery performance, plus superior customer service. We guarantee that your refrigerated commodities will be delivered with the same effort and attention you took in producing the commodity. 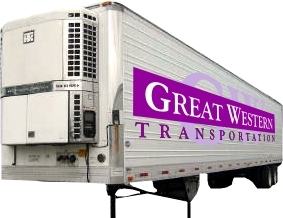 Great Western Transportation is your premier transportation choice for shipping your temperature sensitive perishable and frozen goods. Providing a single point of contact for all your chilled, frozen and temperature controlled truckload and LTL shipments.